TEPA 2010 conference considered manifestations of the Relativistic Runway Electron Avalanche (RREA) process on Earth Surface in Atmosphere and in Space. The Thunderstorms and Elementary Particle Acceleration (TEPA-2010) conference was held from September 6 through 11, 2010 in the Nor Amberd international conference centre of Artem Alikhanyan National Laboratory (AANL), formerly known as Yerevan Physics Institute, in Armenia. Cosmic rays and space weather issues. UV (240-400 nm) and IR (600-800 nm) radiation flashes observed onboard "Tatiana -1 and "Tatiana-2" satellites (Moscow State University, Russian Federation). Real-time monitoring of the particle fluxes by space-born and ground-based detectors both point to the same RREA origin of TGFs and TGEs. Two types of RREA events were detected on Mt. Aragats: short (~1µsec, inverse TGFs) and long (lasting hours, thunderstorm ground enhancements - TGEs). 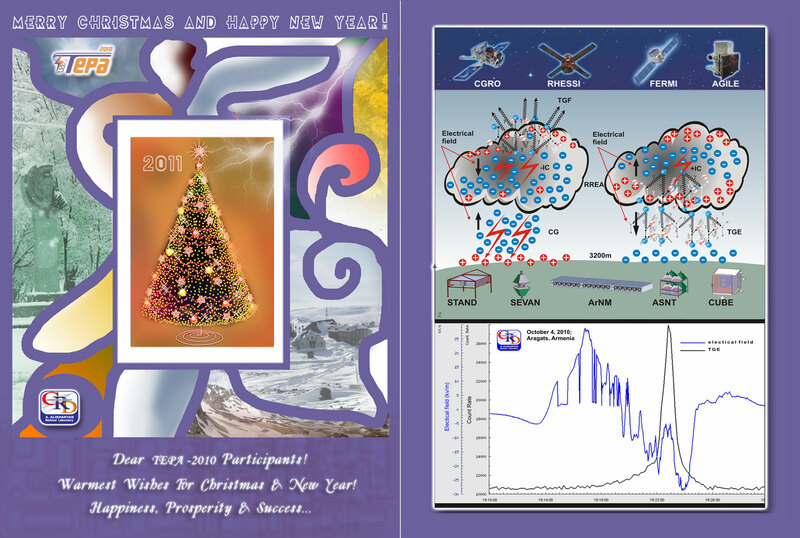 The seed particles for the TGFs are probably generated in intercloud lightning (IC); and for TGEs the seed particles come from the ambient population of secondary MeV energy electrons due to EAS. The proportion of short events was ~0.1% of the entire 8-minute enhancement detected on September 19, 2010. Energy spectra of TGEs detected at Aragats in 2009 and 2010 confirm the simulation studies that the electron energy spectrum has exponential shape and gamma-ray – power law shape. Both spectra for the largest September 19, 2009 event extend up to 45-50 MeV. Huge fluxes of electrons, positrons, gammas and neutrons near the Earth’s surface are undoubtedly newly discovered global physical phenomena that should be studied by experimental and theoretical methods. Particle acceleration and multiplication and broad bandwidth electromagnetic emissions associated with thunderstorms trigger various dynamic processes in the chain atmosphere-ionosphere, causing global geo-effects. The huge values of energy (up to several gigajoules in an impulse) measured by the Tatiana satellites, demonstrate the importance of the research of the atmosphere-ionosphere energy chain and draw attention to the upper atmospheric discharges, which are dangerous for high–altitudes flights. Precise muon detector developed by the National nuclear university (MEPHI) is maybe the first instrument providing data both for the space weather forecasting and meteorology. Simultaneous disturbances of the muon flux and geomagnetic field detected at Baksan point to particle-field interactions in the upper atmosphere. The amplification of the radio frequency electric field signals from EAS during a thunderstorm can lead to the modulation of the EAS size spectra and, consequently, to the possible estimation of the intercloud electric fields by radio measurements. However, we have to remember that the sun is the driving force of processes in the atmosphere, ionosphere and magnetosphere. Therefore, the full chain (solar-terrestrial system) includes the solar wind, magnetosphere, ionosphere and atmosphere. The system is influenced by the radiation from the sun and flux of solar and galactic cosmic rays. The radiation environment near the earth and plasma-geomagnetic field interactions constitutes the space weather conditions. Space weather influences the terrestrial climate and natural hazards, although the mechanisms of space weather effects on the Earth are far from being explained and many aspects of solar activity itself are still unclear. These effects can be understood and quantitatively estimated only by studying the solar-terrestrial system in its entirety: identification of the solar agents affecting the Earth, understanding their occurrence and evolution, and the mechanisms of solar energy transfer all the way from the sun to the earth. This requires integration of all existing information and specific knowledge now spread in many different scientific areas: solar physics, solar wind, cosmic rays, interplanetary space, magnetosphere, and ionosphere, upper, middle and lower atmosphere. The new effects explored and discussed during the TEPA-2010 conference, the inverse flux of huge energy from the upper atmosphere to the ionosphere and even to the magnetosphere, should be considered as integral component of the solar-terrestrial connections. Therefore, the investigation of the RREA process has enormous importance for understanding global change, dynamics and evolution of the terrestrial climate and natural hazards. The goals of the research could be achieved only within broad multidisciplinary cooperation, integrating its observational, research and modelling capacities. The participants of the conference agreed to cooperate to install various sensors, measuring particle fluxes, transient luminous events, broadband radio emission and radiation, on the earth’s surface and onboard orbiting satellites. All participants visited the high altitude Aragats cosmic ray research station in Armenia and saw various particle detectors in operation, aimed for investigating space weather and RREA process. New field meters and lightning detectors installed on the slopes of Mt. Aragats will allow better understanding of the RREA process, space weather, solar-terrestrial connections and its influence on the climate. Among TEPA participants were 10 PhD students. The lectures of Arnold Wolfendale on climate change and possible influence of cosmic rays on origin of live; Anatoly Petrukhin on the new explanation of the shape of high energy cosmic ray energy spectra; and - Razmik Mirzoyan on the history and future of the Cherenkov gamma ray astronomy fascinated the students. Conference proceedings will be available in early 2011. Figure 1. From left to right: Prof. Michail Panasuk, director of the Skobeltsyn Institute of Nuclear physics, Moscow State Univ. ; Prof. Gerald Fishman, NASA-Marshall Space Flight Center, Huntsville, Alabama; Prof. Ashot Chilingarian, director of Artem Alikhanyan National Laboratory; Sir Arnold Wolfendale, Royal astronomer, Great Britain at the Aragats cosmic ray research stations standing near the new measurement set up to detect elementary particles from thunderstorm clouds. Electromagnetic emissions connected with thunderstorms trigger various dynamic processes in the Earth’s magnetosphere, causing global geo-effects and changing electrodynamic properties of the ionosphere. The huge values of energy associated with electron-photon avalanches and upper atmospheric discharges can potentially be a real danger for high – altitude flights. Joint observations by space-born and ground-based facilities. The list of invited speakers will appear on the Symposium website after the distribution of the third circular. Due to the size of the venue and other restrictions, the number of participants will be limited to 75. Therefore, participation in the Symposium is by invitation only. The Symposium will consist of invited and contributed (mostly posters) presentations. Contributed presentations will be selected from the submitted abstracts after their evaluation by members of the International Advisory Committee. Abstracts should be submitted electronically on the Symposium website. The deadline for abstract submission is June 15, 2010. Registration to TEPA 2010 is to be done online via the Symposium website till June 15, 2010. In the near future, we will provide participants with their own account on our Symposium website. These accounts will serve for the submission of abstracts, papers for Symposium proceedings and for providing additional information about accompanying persons, conference dinner and so on. The fee covers the cost of transportation from and to airport, coffee breaks, as well as the Reception and the Banquet, and an excursion to the Aragats research station of Yerevan Physics Institute. Payment of the registration fee will be accepted at the Symposium desk upon arrival. For those requiring an invitation letter please visit the "Travel Info" link on the Symposium website. Transportation from/to the Yerevan Airport “Zvartnots” will be provided by the organizers. Information on the arrival date, time and flight number should be sent to the Local Organizing Committee. During the Symposium the participants will be accommodated at the Nor Amberd hotel. Nor Amberd International Conference Center of Alikhanyan Physics Institute is located on the slopes of Mount Aragats near the village of Byurakan, Aragatsotn District, Armenia. The Center has a rich tradition of hosting high energy physics schools and is well equipped for international forums.